Gujarat State Examination Board Has Published Notification For TAT Secondary(Teacher Aptitude Test)Exam 2017. Candidates Can Apply for TAT-S Exam from 01-11-2017 from official website ojas.gujarat.gov.in. 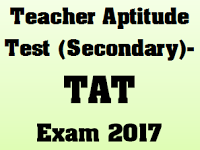 More details Related TAT Secondary(Teacher Aptitude Test) Exam 2017 are as Given Below. TAT Exams is conducted by Education Department of Gujarat,India for Teachers recruitment in various government school in Gujarat's various districts. Before these exams, teachers recruitment was done through B.Ed. 's percentage. But now government of Gujarat has been decided to conduct these exams and teachers recruitment will be done through this exam's merit list. 0 Response to "TAT Old Papers Of 2014 for Reference"